Last week (March 12-15) was IELCOs National Assembly (Synod Assembly). For those of you who have been to a synod assembly, I am sure you will agree with me, the best part about an Assembly is seeing all the people in your church who you don’t see all that often – it’s like a big family reunion. That was definitely the highlight for me of this assembly. I am pretty sure I now know all the pastors in Colombia! In addition, some of the international visitors at the assembly included: a pastor and a bishop from two of Colombia’s companion synods – South Carolina, and Southeast Minnesota, representatives from both the companion Lutheran Church of Finland and Sweden, and our Chicago based, regional coordinator (with the ELCA). Here is a bunch of us with the newly elected bishop (left to right): Pastor Mark Cerniglia from South Carolina, Bishop Herman Yoos from South Carolina, Diofelina del Carmen Torres (wife of the new bishop), newly elected Bishop of IELCO Gustavo Torres, Bishop Steve Delzer from Southeast Minnesota, Mary Campbell, Manager for Relationships in Latin America the Caribbean - ELCA, me, Curtis, and Pastor Mark Johnson from Southeast Minnesota. Another highlight during the assembly was the forming of a pastoral committee to support the Human Rights program. This is a committee Curtis formed with pastors who are interested in supporting human rights, preaching about human rights, and learning more about the role of the Lutheran Church in the Human Rights Program. Curtis with the newly formed Human Rights Pastoral Committee. The National Assembly closed with a big, festive worship. During the worship two new Pastors were ordained: Pastor Angelica and Pastor Luz Marly, and they installed and blessed the new Bishop Gustavo. This was a packed full church, and a very special and festive way to end the assembly. Pastors of IELCO with the children during the children’s sermon. This past weekend (March 21-23) was the National Youth Assembly. The weekend started by caravanning large busses overnight Friday to Yopal. We woke up Saturday morning in Yopal and started the retreat. For many of the youth, this was like a huge family reunion. By the time we left, it felt like leaving a family reunion for everyone. Like a youth retreat in the states, this retreat had dynamic worships, workshops, games (a pool), lots of laughing, and of course not enough sleep. I was asked to lead a session on youth empowerment. 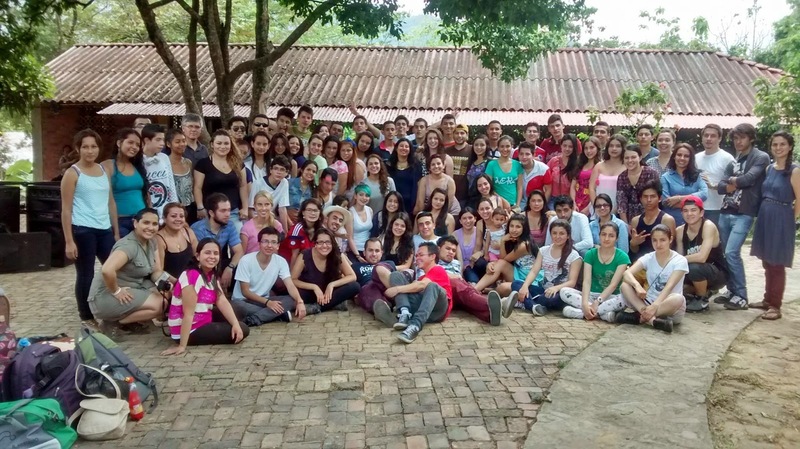 What an honor to be a part of this group and meet so many of the Lutheran youth from all over Colombia! The youth also have a governing group, with two youth from each region. During the retreat they elected the new delegates as well as a president, vice president, secretary, and treasurer. The youth are in charge of planning their own retreats, keeping their own budget, and the president from the youth also represents the youth on National Executive Committee for IELCO. Big responsibilities! Here is the new youth governing group – this was part of their commissioning during the closing worship Monday morning. Left to right: David Romero (former president), Mauricio Mack (current president), Marion Coy (newly elected president) and the rest of the newly elected delegates.